Description: One of the ex-CN Rebuilds backs past our Amtrak Train. Description: Another train leaves the platforms. Description: MBTA commuter train with engine #1122 in the leads heads outbound, westward towards Fitchburg MA. Description: MBTA 1122 sits at South Station. This set will later deapart for Middleboro/Lakeville. Description: Two sets, led by different euqipment, at South Station. Description: 1072, 1122, and 1034 sit at South Station. Description: From left, MBCR 044 arrives from Kingston, 1072 idles, and MBCR 015 departs for Middleboro/Lakeville. Description: Outbound commuter passing Lawrence Yard. Description: GP40MC's 1122 and 1135 idle in North Station side by side. 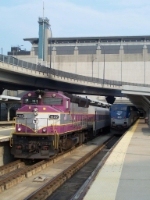 Description: 4 Commuter Rail sets idle in North Station awaiting departure to their respective destinations. Description: MBTA Commuter Rail line up in North Station at 3:20pm. From left to right, 1000, 1001, 1053, 1122, 1135, 1012, and 1129. Description: The rear end of passenger engines are not seen very often. Description: Fitchburg bound MBTA commuter rail train arriving at Ayer commuter rail station. Description: Boston bound MBTA commuter rail train departing the Ayer commuter rail station. Description: MBTA 1122 and 1017 lead a rare two double-header commuter train out of Ayer.